Guinea pigs are one of my favourite pets. They are popular with kids, they do a great job of mowing the lawn and make the sweetest noises. Guinea pigs are social animals but when they are stressed or overcrowded hair barbering (chewing on the fur of other guinea pigs lower in the pecking order) will occur. Males in particular can be aggressive towards other males. This is a common problem in Australia over summer. Ensure outdoor cages are placed in shade and have adequate ventilation. Consider placing a frozen water bottle in the cage for cooling or place inside with airconditioning. Signs of heat stroke are panting, slobbering, weakness, convulsions and death. Cooling by misting or bathing in cool (not cold) water. Both lice and mites can affect guinea pigs causing itching and hair loss.The mite Trixacarus caviae is common in Australia. If parasites are suspected your vet will perform skin scrapings to examine under the microscope before prescribing treatment. 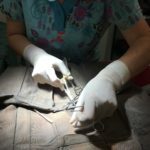 The surgery involves removing the ovaries. Guinea pigs have teeth that grown continuously throughout their lives. This has developed because their natural diet is composed of abrasive, high fibre vegetation. 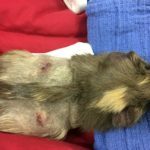 Unfortunately, pet Guinea pigs are frequently fed poor quality diets composed largely of pellets or chopped museli mixes which in contribute to a range of health issues including dental problems and obesity. When Guinea pigs aren’t able to grind and wear their teeth sufficiently the teeth may become overgrown resulting in problems such as sharp edges that can cut the tongue or cheeks, tongue entrapment preventing normal movement and swallowing, or dental abscesses (pockets of infection). 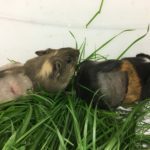 For proper teeth wear Guinea pigs need to be fed lots of grass hay, fresh grass and a selection of other fresh veggies and leafy greens. Vitamin C is also important for dental health to prevent scurvy. Read our Guinea Pig Feeding Guide for more information. Treatment of dental disease involves filing the teeth down using specialised equipment under general anaesthesia. Performing dental work in a guinea pigs mouth is difficult due to the small mouth opening. Bacterial enteritis causes diarrhoea. It may be caused by contamination of food and water. It is important to wash veggies and provide a clean source of drinking water. The soft pads of the guinea pig are made for living on soft grass and earth. If kept on wire cage floors they can develop sores on their feet. Vitamin C deficiency will also make development of pododermatitis more likely. Ensure they have plenty of soft bedding like shredded paper, straw or hay or kitty litter such as a recycled newspaper pellet. Keep their bedding clean by replacing regularly, daily is best as urine will build up quickly. Obesity may also contribute so ensure your guinea pig is in a healthy weight range. Like us humans, guinea pigs require vitamin C in their diet. Other animals can produce their own vitamin C from their intestinal flora. Vitamin C is involved in healthy gums and skin so deficiency can be a cause of many of the problems we have already talked about. Fortunately vitamin C is found in fresh veggies and fruit so feeding plenty of these daily will ensure your guinea pig stays healthy. Good sources include capsicum, kiwifruit, berries, papaya etc. 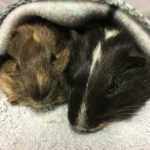 (see out Guinea Pig Feeding Guide for more details). Vitamin C is unstable and deteriorated quickly with storage so pellets and hay are low and must be supplemented with fresh grass, veggies and some fruit. And because I can’t say it enough, avoid grain mix diets as these are deficient! Where guinea pigs have developed scurvy due to a deficient diet we will recommend supplementation with vitamin C until the problem is corrected. Bacterial respiratory infections sometimes accompanied by middle ear infections can affect guinea pigs. Symptoms include difficulty breathing, discharge from the nose or eyes, lethargy, innapetance, incoordination, circling or head tilt. All guinea pigs should have an annual wellness exam to assess there dental health and detect health problems early before they become severe. Book an appointment online now with one of our vets.